Induced abortions are the direct result of a medical procedure intended to end a pregnancy prematurely. These are also called elective abortions, or simply referred to here as an abortion. This remarkable photograph of a tiny preborn baby in his unruptured amniotic sac was taken after surgery for an ectopic (tubal) pregnancy at the University of Minnesota by medical photographer, Robert Wolfe, in 1972. 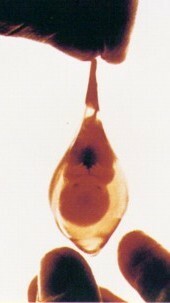 This picture demonstrates the remarkable early development of a preborn baby at only six weeks after conception. Abortions are most commonly performed between the sixth and twelfth week of pregnancy, where conception occurs at week two and birth occurs at week forty. Abortions are also performed routinely up to sixteen weeks and then less often into the later months of pregnancy. Women obtain abortions for a number of reasons, usually having to do with relationship and interpersonal issues, but other concerns like health of the mother, health of the fetus, or finances may factor into the decision. Abortions may be performed at a hospital, doctor's office, or women's health center, but most take place at abortion clinics — facilities which specialize in surgical abortion. Most states require that the abortion provider be a licensed physician, but some do not. In these cases the procedure may be done by a nurse or other clinician. An abortion may be performed either surgically or medically, via several different abortion techniques. Surgically implies the use of surgical instruments to remove the unborn child or instillations to kill the fetus while still in the uterus. Medical abortion (the abortion pill) implies the administration of drugs to the pregnant woman to end the pregnancy. In both of these cases it is the death and removal of the fetus, or unborn child, from the womb that causes the pregnancy to end. Abortion, like any surgical procedure, carries a number of health risks which are increasingly more serious with the advancement of the pregnancy. Some people attempt abortion on their own through the use of herbal abortifacients, but these are less safe than surgical abortions. The unborn child is very alive prior to the abortion procedure, and there is strong evidence that the unborn child can feel pain as early as twelve weeks. The abortion procedure is thought to be painful for the unborn child, as no anesthesia is administered to the fetus. In the case of a surgical abortion, anesthetic is usually administered to the pregnant woman. The abortion issue is very controversial for a number of reasons. Because the essential component of abortion involves ending the life of an unborn child, many see it as no different than killing a helpless infant. Others see abortion as an issue of personal autonomy, feeling that the rights of the woman outweigh any rights the fetus may have. Presently, the United States government and judaical system agree with this latter perspective, making abortion legally permissible in every state throughout the entire nine months of pregnancy. Nonetheless, many groups are actively trying to make abortion more difficult or altogether illegal. Other groups promote abortion and are actively trying to make the procedure easier and more accessible. It is the experience of many crisis pregnancy counselors and therapists that elective abortion results in emotional after effects. This is because a woman often goes into the decision unaware of the details of the procedure, the development of her unborn child, and how her relationships will be affected by the experience. Although there are women who feel that abortion was their best choice, many others regret the decision and suffer from Post Abortion Syndrome. Occasionally women are physically damaged by an abortion, even to the point that their lives were endangered by the procedure. If you are considering abortion, you are encouraged to examine all aspects of the issue in order to best make an informed choice. You need to feel good about your decision. The more you can learn about abortion as well as alternatives to abortion, the less likely it is that you will make a decision that you will later regret. Contact your local pregnancy centers. A caring counselor can help you explore all your options.